Now you don't have to drive across the country in search of a driving school to learn towing skills. 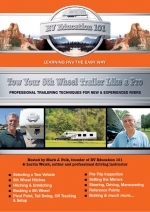 Video hosts Mark Polk (RV Education 101)and Lorrin Walsh (Professional driver & author of Tow Your 5th Wheel Like a Pro Book) provide you with the tools you can apply to help you become a professional driver. This means the development and execution of unique driving/towing techniques needed to become a safer and more confident driver so you can tow your fifth wheel like a pro. 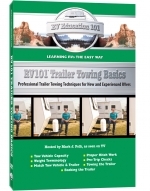 This DVD is your complete guide to professional driving and towing techniques for every level of experience. This video takes commercial driving training techniques and converts them into easy to understand terms. It also explains basic rules that can be applied to any vehicle you are driving. 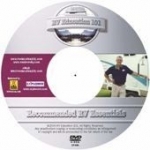 A complete video guide to towing a travel trailer for beginners to experienced RVers. Take the time to properly educate yourself about trailer towing, weights, hitch work and backing. Let us teach you some tips and techniques to make towing much easier. How to properly match your tow vehicle to a trailer, learning the terminology, proper and safe hitch work is a must. Mark Polk has been an expert witness in a few legal cases, where people were paralyzed and killed. The common factor in these cases involved improperly matched tow vehicles and trailers. Don’t depend on automobile dealerships and RV dealerships to always give you 100% accurate information. Do your homework before purchasing a tow vehicle and trailer. 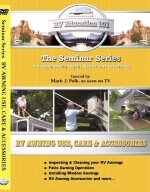 RV Expert Mark Polk walks you through the step-by-step process to using, caring for & accessorizing your RV awnings. Polk explains the different types of RV awnings and awning fabrics, and how to properly clean & inspect the awning fabric & hardware. Next he demonstrates how to use the awnings on your RV & how to install a window awning in six easy steps. As an added bonus the video demonstrates some products available on the market to fully accessorize and enjoy your RV awnings. *Does not apply to automatic awnings. By Mark Polk Length - 10 min. 30 sec. Our training videos have helped tens of thousands of RVers over the years; but we realized that even though we were showing you how to use your RV we weren't telling you what you would want or need to take with you to make your RV experiences more enjoyable. When you buy your first RV you really don’t know what to expect the first few times you venture out on a trip. Even after receiving the RV Dealer "Starter Kit", it can be disappointing and frustrating to get to the campground and discover you don't have the essential items you need for your RV. To assist "new RVers" I have developed what I refer to as my recommended "RV Essential Items List." These are not the nice to have items; they are the essential items to make you RV experiences more relaxing and trouble free. Most of these essential items are available at your local RV dealership. You’ve had a great year camping, now it's time to put your RV away for the winter. What do I do? Where do I start? Don't worry, you are not alone. These are common questions, ones that RV expert Mark Polk will answer for you in this specialized winterizing and storing Download. Winterizing the RV protects the RVs water system, but what about the tires, batteries, generator, chassis storage, coach storage and other components that can be damaged if they are not properly prepared for short or long term storage? You will see detailed step by step instructions on how to properly winterize & store your RV. To make sure you remember what you need to do, and in what order, a printed checklist comes with this Download. This checklist includes supplies needed and the steps to take for you to complete the project.Let RV expert Mark Polk, help you to thoroughly understand all of your winterizing and storing needs! This #1 best seller e-book is the first in The Cooking Ladies' Favorite series. The Cooking Ladies are former restaurant owners who travel North America in a 40-foot motorhome. These two vivacious food columnists, travel writers, restaurant consultants, and cookbook authors blend taste and travel searching for the ultimate recipe ideas. In The Cooking Ladies’ Favorite Happy Hour Recipes, It’s 5 o’clock somewhere, the dynamic duo takes great pleasure in tantalizing your taste buds with 30 of their favorites. And to make this cookbook even more outstanding, The Cooking Ladies have included a photo of each finished dish. Recipe ingredients are given in both Imperial and metric measurements. 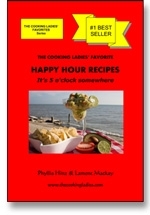 Get Phyllis and Lamont’s favorite easy-to-make, something-for-everyone Happy Hour recipes now.